" When God is your goal, jeeva must follow the inner mind. You don't need anybody's permission. The great devotee Kabir said 'Why do you need the permission of family and friends to participate in Lord Rama's bhajan? Rasa dharma is beyond everything. Radha is present beyond creation! " " Nobody could explain why Radha's name is not found in Bhagawata. Our Hindu philosophy is very deep. Radhaji wants you to lead the life of a rasika. The world is filled with people living a worldly life but not rasikas! Among the people who gathered to listen to Sri sukha's commentary on Bhagawata, not a single person could give happiness to Mother. What is the use of such a life which does not satisfy Mother? One who cannot serve God does not deserve to live! " " All relationships in this world are due to some debt owed in the previous births. The mahatma's life must not be seen from the worldly perspective. Do penance. Your penance, your power is not enough. I will give you the power to do penance. Thoughtless mind generates divine light, divine love and divine power. This is the secret of the whole philosophy. " " Radhaji transformed the spiritually negative atmosphere in Srilanka. She is showing unimaginable powers. Her grace is very powerful. I am constantly in the bhava that Mother is with me. Due to super imposition of Radha bhava, I played with a cobra then I lost the fear complex of cobra. I believe in philosophy of super imposition. Radha alone is real. This is my philosophy. No other world can equal rasa world! Rasa for power; rasa for beauty; rasa for leela! She is also known as Raseswari, the sovereign of Rasa. Radhaji is the centre of the power. Her prominence is extraordinary as extolled by the Vedas. " " She selects those who must come near Her. The power of rasa has many great powers. Worshipping rasa is the highest form of worship. I worship rasa! We do not come to this world easily. We are not linked to this world. Because I was called from Brindavan, I, Radha came down. " " The scriptures define Radhaji as Bhaktanugrahakatara - always eager to bless Her devotees. She cannot bear it if we are sad. Believe this point. Radhaji's path is Venu marg, the path of love. In Krishna's sudarsan marg, the path of punishment, there is bloodshed but Mother's path has only love. Follow Venu marg if you really want the world to prosper and be peaceful. The only wealth one must possess to reach Her is Her grace only! Para lies beyond the manifested and unmanifested worlds. It is the highest. One must attain Radhaji's grace to reach that world of bhava. Do sadhana for Her grace. You must cross the world filled with maya and the three base modes. Her grace is our sadhana. Without Her grace, jeeva cannot move to the higher world. So you must divert all your attention towards God's grace because it is unavoidable and inevitable! Divine grace has no sadhana. One who attains that grace remains in that divine bhava constantly and gives up everything else. He thinks of Mother and weeps. I experienced such a state. I have divine interference. That is how, I am moving forward. " " One who yearns for Mother's grace; one who surrenders to Her; cannot live without Her even for a split second. I wept for Mother so many times. 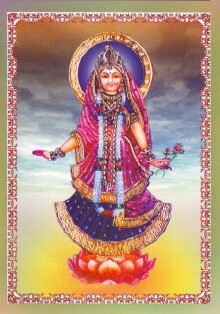 Radha is the highest deity. We all must go near Her. Incessant Radha bhava dhyana is the only royal path to reach Her. "